Monsieur Nov, a French R&B/Neo-soul artist of Asian decent, is well known in France and Europe but is almost unheard of in the U.S. In fact, I came across his music accidently but was so glad when I did. His album “Groove Therapy,” — released this year — is available for purchase only on iTunes. According to www.Frenchmusicblog.com, “BCJC” stands for “basket, casquette, jean cartonné,” — an outfit of sneakers, a baseball cap and jeans. “Mon Ex,” track four, can be easily played as a slow jam at a club. Its smooth tempo beat coupled with Nov’s rich R&B voice can be simply seen as four-play. Track number nine, “Jasmine” makes you want to change your name. On this track, Nov uses different tones showing his variety of vocal ranges. 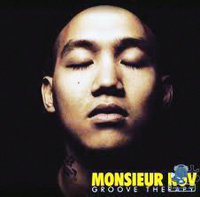 Monsieur Nov is the epitome of R&B/Neo soul, ranking with other Neo-soul greats such as D’Angelo and Maxwell. The album is entirely in French but don’t let that put you off. It adds to the romance and mood. In fact, “Groove Therapy” should come with a warning because, once you listen to it, you might find yourself calling someone you would not normally call to come listen with you.